Inspired by the glories of early 20th Century juke joints, rent parties and road house dives, "Juke'n The Uke" is an outstanding collection of 15 classic blues, rags, jug band songs and hokum arranged for finger-style ukulele. Puts the fun back in funky! “Juke’n the Uke” finally answers the age-old question, “I wish somebody would tell me what Diddy Wa Diddy means?" Playing a handful of great ukuleles–as well as vintage guitars, mandolin's, Hawaiian steel guitar and even an 1890's banjo-guitar–Mark display the chops that has made him an in-demand session musician, performer and workshop leader since before the flood. An instructional book with Tablature for all of the music–and more–is available separately. 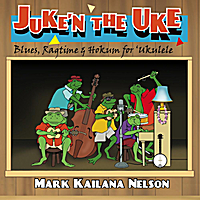 Mark Kailana Nelson does it again with a great new CD titled “Juke’n the Uke”. It’s a collection of blues, ragtime, and “hokum” for ukulele. “Fishin’ Blues” If you ever took your wife or girlfriend fishing, and she out-fished you, then, this song is dedicated to you. “Hale’s Rag” is a slower-paced “rag” and I enjoyed it. I never thought about there being a laid-back rag, but this is it and I really like it. “K.C. Moan Blues” has a nice blend of pickin’ and steel work. The vocals are at the top of Mark’s range, but for this song, it works. The feel is bluesy and reminds me of a lazy afternoon. “Diddy Wa Diddy #2” This song is a story. The song is credited to Blind Arthur Blake. It was recorded some time in the late 1920s. Blake was one of a group of influential blues artists that played the backwater dives and gin-joints mostly in the south. His guitar playing still influences players today. “Staggerlee” has a great picking intro. I am hearing a banjo uke in this number. This is an old ballad about Stagger Lee Shelton, a murderer. Follow that number with “Wild Cow Blues” listen to the lyrics, funny. Good Steel work. “Yas Yas Yas” This number starts with banjo uke. It’s a somewhat bawdy tune by “Blind Blake” Alphonso Higgs, a Nassau tenor banjo blues calypso performer. “Okolehau Blues” is a song about drinkin’ Hawaiian shine. Next comes “Sister Maude Mule” featuring Kevin Carr on fiddle. “John Henry” is an instrumental. It has deep Appalachian roots. “Let the Mermaids Flirt with Me” is a Mississippi John Hurt tune. This song is a fun blues tune (is there such a thing?). Yep. “Palakiko Blues” sometimes called “Hawaiian Blues”, I really love this melody. I loved it from the first time I heard it. “Blues in the Bottle” a Texas two- stepper. Kick up your heels and have a fling with this one. Then, wrap up this CD with “Kona Rag” (a Mark Kailana Nelson original). This is a great way to end the collection of songs. Mark has a book for this CD available and I highly recommend it if you want to know more about the music in this collection and are eager to play along. The book features tabs and notation together. Like all of Mark’s books, this is a great resource that will help you learn more about reading music and playing things like pull-offs, hammers, and slides. The CD is a great mix of old blues standards and the book is an excellent addition. I recommend them both. Then, listen to the CD and play along using the book as your guide. Have fun playin’ the blues.